The deadline for 5.5 million households to file taxes in Greece depends on the category of filing and final digits of a taxpayer’s AFM (Greek tax number), with married couples using the husband’s AFM. Note that this article provides basic, essential information on where to find tax forms and how and when to file. The last date to file for the majority of taxpayers was July 15, 2011 for the 2010 tax year. 3. Misinformation or misunderstanding can result in serious monetary penalties and criminal charges, since inaccurate tax returns can be interpreted as tax evasion, which now carries jail time. Advice should not be dispensed or taken lightly. Deadlines for the 2011 tax year will take place after elections from April 30-June 15 for E1 returns and until July 31 for E9 filings. Because a second round of elections are necessary, the deadline for E1 declarations was extended to June 30, 2012 July 16, 2012 for everyone submitting returns electronically (mandatory for annual income of 12,000+/euros) and July 2, 2012 for paper returns, regardless of AFM/tax number. *Article last updated June 2, 2012. Tax laws have since changed — this article will not be updated and no new article is planned. See ‘Important Note’ at the end of this article for advice. Who needs to file taxes in Greece? In general, the majority of people who own property and assets in Greece, earn income, collect a Greek pension or unemployment benefits, plus Greek citizens abroad need to file a tax return or forodilosi (tax statement). Many countries have double taxation treaties, and embassies/consulates sometimes provide information on such issues or have a list of recommended consultants. I cannot advise you for the reasons stated above. To find out whether you need to file, please consult an adept accountant or call/visit the eforia (DOY) nearest your legal residence to inquire. Locations can be found at “List of DOY-Eforia Tax Offices in Greece” in English or any map book available at a periptero (kiosk). As of January 1, 2010, most taxpayers in Greece must provide evidence of purchases to qualify for tax-free status or at least minimize risk of possible penalties. See “Income tax and receipts,” which details what purchases are eligible and how to calculate the total receipts needed. Annual E1 tax forms are sent to the address on file at the DOY/eforia/Greek tax office local to your residence, or forms E1 (Basic), E2 (Rental), E3 (Companies/Professionals), E5 (Partnerships), E7 and E9 (Property/Assets) can be picked up in person at any location. A complete catalog of Greek tax forms is also available for download at the GSIS e-documents Web page. d) are lawfully obliged to file online this year, based on information received about your work situation in 2010. Instructions and Advice from the Ministry of Finance can be downloaded or read at, “2011 Greek Tax Booklet,” Most Common Questions about the E9, Guide to E-filing, and Frequently Asked Questions. All are in Greek, and I have no plans to translate them. Forms and instructions are only in Greek; they are not available in English. An accountant will often not need your forms, as he/she enters relevant information into a program and prints out a completed tax declaration suitable for filing. *Certain categories of taxpayers must file hard-copy tax returns and do not have the option to use TAXISnet. Electronic tax filing (ηλεκτρονική υποβολή φορολογικών δηλώσεων) can be done in Greek with the revamped TAXISnet at www.gsis.gr or taxisnet.gr, allowing at least five (5) days before the final date, as it takes time to sign up, receive authorization and become familiar with the system. The Help page explains how new users can register and activate an account in four steps and tells existing users — anyone who signed up before December 6, 2010 — what has changed since 2010. Online statements for E9 filings were to begin June 1, but the system was not ready. It opened December 5 to accept tax declarations and corrections, though some taxpayers will still be required to file a hard copy (i.e., change in marital status, first filing). accept submissions until September 1. December 1, 2011. Last day to file an E9 for the 2010 tax year (aka, 2011) via gsis.gr is January 31, 2012 March 30, 2012 for individuals and April 30, 2012 for businesses. TAXISnet is not available in English or any other language, but an estimated 2.5 million taxpayers qualify to file online. The Ministry of Finance makes it mandatory that everyone with a job or a business submit taxes online — either privately or through an accountant — in a bid to streamline processes, save money, save trees and make audits easier. However, with computer literacy and broadband penetration in Greece being low, and the TAXISnet system not being 100 percent functional, certain categories of taxpayers can treat 2011 as a transition period and submit hard copies in person or via a special ‘Taxis Post‘ envelope from ELTA (Greek National Postal Service) that must be postmarked on or before the deadline. Anyone filing online should use the option to print a receipt as evidence of submission, and all taxpayers are encouraged to keep a copy of their forms and receipts. A tax clearance certificate (Έκδοση Βεβαίωσης Φορολογικής) can be issued online. A printed tax statement or ‘Ekkatharisto’ from the eforia should arrive months later by regular mail. Tax filing deadlines were supposed to begin March 1, as every year, but have been delayed twice because the TAXISnet system was down, not made available until April 1, and is still plagued with technical problems and unannounced outages. And, predictably, deadlines were changed again. Dates are normally staggered to avoid inundating the TAXISnet system and efories, but this year the first three categories are filing simultaneously during the Easter and May Day period and the last two groups overlap. Please keep this in mind and stay informed of potential strikes if waiting to the last minute. Deadlines by AFM (Greek tax number) typically do not apply if an accountant is filing them for you. It was also announced late August November that anyone needing to file tax documents of any kind for 2011 or past years could do so without penalty or fines until September December 30, 2011. *New arrivals to Greece: The 2011 tax filing applies to all tax/property/income activity for the year 2010. The 2012 tax filing applies to all tax/property/income activity for the year 2011, and these deadlines have not yet been posted. Anyone deriving income from farming, allocating farmland or earning rental income from agricultural land. The deadline to file electronically is June 15, 2011. This category includes freelance or self-employed professionals; persons whose sole source of income is from rental properties; owners of boats, airplanes, motorcycles or vehicles if not exempt. The deadline to file electronically is June 15, regardless of AFM. This category includes board members that derive income from a company/business; insurance agents, bankers and brokers; and Greeks/foreigners not living or earning income in Greece but are obligated to file for another reason (i.e, They own property, vehicles, etc.). The majority of taxpayers fall in this category — salaried workers, pensioners, taxpayers in Greece who earn income abroad, military, sailors, and Greeks/foreigners living abroad who derive income from Greece. 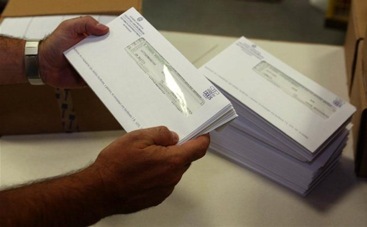 Salaried workers should have received the necessary taxis paper from their employers by February 16. If you use the online system to file a tax return, you have until June 15, July 15, 2001 regardless of your AFM (Greek tax number). Please note that I am a journalist and not a tax accountant or lawyer and cannot dispense tax advice or answers specific to your household or nationality, as there are thousands of tax laws, daily amendments and cross-border considerations. I have provided the tools and resources necessary to start you on the right path. For the past seven years, I have employed an adept accountant who files my forms for a small fee. I have a policy against recommending or endorsing companies and private persons because my standards are different than yours, and I cannot be held accountable if you have a less than stellar experience. If you need a recommendation, ask someone you know and trust or see if the embassy/consulate has a list, then interview a few and select one based on personal preference. Many times you cannot know if an accountant is knowledgeable until you witness what he/she can do and check their work by asking questions at the tax office. That’s how it is in Greece. — Info gathered from 13 years of experience with the eforia and completing my own tax forms for six of them. Ti malakies grafeis re amerikanaki , mas poulas tsampouka diladi me ta klemena?? , proti fora mpika sti selida sou kai diavasa ton tropo pou parousiazeis “ta pnevmatika sou” dikaiomata!! Ola sou ta arthra einai klemena apo tis dimosies ipiresies, ti mas milas gia copyright i mipos an kapoios antigrapsi ta arthra sou tha steils to sompolo na mas ta klase??? Koritsaki edo einai Ellada ama den to eheis parei eidisi kai i Ellada einai o topos tou kano oti goustaro. Kai se symvoulevo na vgaleis aftes tis egoistikes malakies peri esou kai lipa giati ta vlepo ta arthra sou se 100 blogs kai se alla 10000 facebok comments….mpikes??? My website existed before government websites, which is the reason it was started. Also all my articles have details drawn from first-hand experience (myself and readers), so it’s not possible I plagiarized any information. In fact, I’ve caught official websites, lawyers and Greek consulates/embassies plagiarizing me. Careful who you accuse. In this case, the only malakies being spoken are from your mouth and reflect badly on you. Hi there Kat, being a Greek citizen abroad this website has helped me on countless occasions. I only have a few questions and maybe you know the answers because I think they are general. 1) I haven’t paid anything or I have never filed a return since I got my AFM (in April 2010 when I was on holiday there).. is there a penalty for this? And does it mean that as soon as I get an AFM I already am responsible for the tax? 2) If my father (who has passed away) owes any money to the tax office, is it me who has to pay his debts? Any possible answers/help will be greatly appreciated! 1. Having an AFM does not mean you are automatically obliged to file a statement and pay tax. Your residency status (i.e., whether you live in Greece 185 days a year), double taxation agreements, source of income and the amount collected determine if you file, in what country and when. If you were/are obligated to file and missed the deadline, there is a penalty. 2. Without delving into your private business, the next of kin typically gets a copy of a certified death certificate, registers this event in the oikogeneiaki merida and makes the rounds to various public sector offices to declare their relative deceased, including the eforia. Assuming you are the next of kin (aka, your mother has passed on or is divorced from your father, you don’t have older siblings), you are responsible for making amends and closing his affairs. It’s always nice to get positive feedback, and I’m glad to hear this website has helped you. I would like to do more, but time and professional/personal commitments limit what I can give and constant updates make it difficult to publish new material. I am english and i own land in Greece,is there a new tax on land ownership for us Eu residents who are not Greek? I know that people are eager to learn details of new austerity measures and how they’ll be affected. Last year I wrote up a list of austerity measures before they were published into law and paid dearly for it by updating it for weeks with revisions, so I’m holding off until it’s final. Tax laws in Greece change fairly often, so this also does not help and may require an accountant who is adept in both Greek and UK tax laws. I have property in Dafni, Laconia. I am a US citizen and I was told i have to pay taxes on the property. How do I pay the property taxes? If you earn no income in Greece but have property, you are obligated to file an E1 statement with zero entries and an E9 for your property. Beyond that, I cannot help you for reasons given above. I provide relevant links and advise you to contact an accountant who is familiar with current/changing tax laws. Thanks for your great website and enormous efforts. You say on page 3 of Tax Deadlines 2011 that it was announced ‘late August that anyone needing to file tax documents of any kind could do so without penalty or fines until September 30, 2011’. Under ‘Sources,’ it’s the last one listed: “Νέα ευνοϊκή ρύθμιση όλων των εκπρόθεσμων δηλώσεων.” The story ran in all Greek-language newspapers, and I announced it twice in English to 12,000 people on my Twitter feed. My wife & I have owned a small house in Perdika, Aigina, for over 20 years & since my UK retirement, have spent 8 months here & 4 months in our UK home, on average. We are still classified as UK residents & pay tax on my pension (private + State) through the UK ‘PAYE’ system. As joint property owners in Greece we complete a Greek tax-return every year showing income before & after UK tax. With the UK & Greece having a long established agreement to avoid double taxation, we have never been asked to pay any taxes here apart from the VAT on all we purchase & annual road tax for our Greek bought & registered car. We quite understand the new Property Tax & will pay our share without question. However we have now been hit by the ‘Solidarity Levy’ which our Greek accountant says we must pay as it is an indirect tax upon our UK pension income for the first of 5 years. Having paid the first installment promptly to avoid interest charges, we ask if our accountant is correct & if this additional tax on our UK income is legal? We have no Greek sourced income at all, but certainly spend our UK money here to the benefit of the Greek economy! Not an urgent matter, but would appreciate your comments. If you spend more than 185 days in a country, your primary residence is in that country. In your case it’s Greece. The solidarity levy applies to personal income. Beyond that, I cannot help you. As I say in this article and other articles pertaining to taxes, I am not a tax accountant or lawyer and I am not qualified to dispense advice on these highly complicated matters for reasons given above. Explaining the new property tax (a single measure) required filtering more than 100 articles, translation of government circulars, several revisions and dozens of unpaid hours to distill it into 2400 words, and I’m still answering questions on it. I understand your position, and I know it’s difficult to get a hold of reliable information, but there are hundreds of tax laws (literally) and there’s no possible way I can decipher, translate and explain them all, then answer questions as they pertain to other countries’ laws. Many thanks for your advice on the ‘Solidarity Levy’. Maybe you can also offer some advice regarding validity of a UK Will, if one should be unfortunate enough to die in Greece! Some UK friends have been told by their local Notary that they must write Greek wills to be valid here? It’s much more complex than writing in Greek. hi! i just want to know if i lost the copy of my income tax return last 2010 how and where can i get another copy.? thank you so much. You can go in person to the tax office nearest your registered address and request a copy. As far as I know, Greece still doesn’t offer the option to access and download past filings online via gsis.gr. All taxpayers should keep personal records and hard copies of statements and supporting evidence, in case of audit. I believe you can now register to pay your greek tax online. Could you possibly let me have the web address for this as otherwise we will have to send money to another friends account for them to pay so therefore will not get the pink paper although we do not spend more than185 days in greece yet we still collect the pink papers. We believe the second half of the austerity tax has to be paid by 16 th Jan and we are running out of time. Your comments and information are brilliant, keep up this good work thanks NF. I have just discovered this site and have so far found it very helpful. I live abroad, and together with 2 siblings, inherited property in Athens from our late father. His Attorney has been dealing with our taxes etc but after a difference of opinion, he has now chosen to resign. When are the deadlines for 2011 Tax Returns (we receive rental income) and how can I find someone new to handle our affairs, in Greece, on our behalf. In reference to your second question, see “Important note” near the end of the article. Hello there I am English and have lived in Greece for 3 years. I am employed in the summers only, and worked 09,10 and 11 and will work this summer also. I claimed Tameio in the winters of 10 and 11. I do not own property or assetts here in Greece. I have never appointed an accountant or filed a tax return due to my low earnings (around 6500 euros each year including Tameio.) I live with my English boyfriend who also earns a similar amount. Do you know if we should have filed tax returns? Hi, thanks for making this site and providing all this information and support. I am a greek australian and i own a small property in Greece, less than 150 sq.m. of which i earn no income. I have a tax file number. I had a friend of mine, who filed an E1, E2 and E9 for the financial year 2005. He did not file for the financial year of 2010 which he was supposed to do, but they only accept online applications now. I’ve just finished registering with gsis online. Even though my greek is ok, i don’t know how to submit the application for zero entries. I tried to follow the 2005 application, but not possible. Once logged on, i clicked on “Efarmoges”, then clicked on “Diloseis Forou eisodhmatos Fisikon Prosopon E1,E2 and E3”. I click on “Eisodos”. I changed the year to 2010. I couldn’t understand how to submit my application. I’d like to know how to file an E1 for the financial year 2010. The GSIS website offers instructions. For the reasons stated in the article and other comments, I do not offer tax advice or assistance. I am not Greek, an accountant or a lawyer, and I cannot be responsible for people’s private affairs.